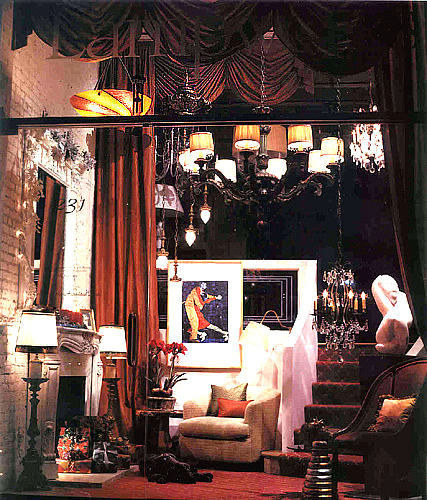 Alma Nugent, CID, ASID, is a New York State Certified Interior Designer Ms. Nugent’s window exemplifies that There’s No Place Like Home for theHolidays, celebrating New York City’s beautiful seasonal windows, diversity, and eclecticism.The main focus is a large, hand-carved chandelier from the 1920’s with custom shirred silk drum shades with crystal trim. Oversized hand-leafed parchment shields top a pair of 19 th Century bronze candlestick lamps flanking the painted fireplace and mirror. Alma Nugent is the immediate past President of the New York Chapter of the American Society of Interior Designers (ASID), and has been profiled in The New York Times. In addition to upscale residences, Ms. Nugent ’s projects include health care facilities, corporate offices, and a yacht.